More than 9,000 square miles of U.S. federal Gulf waters are closed to commercial and recreational fishing today thanks to the BP oil spill. However, government offices today claimed that seafood from the Gulf is basically safe to consume, based on the results from their latest battery of tests. You gonna eat that? Companies responsible for the environmental disaster spilled about 5 million [Correction: in the original post, I wrote “gallons” and have corrected the typo] barrels of oil, accidentally. They poured about 2 million gallons of oil dispersants into the Gulf waters on purpose, though. The dispersants were supposed to break up the wildlife-choking slicks into droplets that could be more easily digested by oil-eating bacteria. Or at least, they’d make the water look more like water and less like tar while the cameras were flying overhead. At the time of the spill, the U.S. Geological Survey (USGS) sent scientists to the Gulf to help with the oil spill cleanup. Even that federal office knew nothing about the dispersants’ likely impact on sea life or humans. USGS director Maria McNutt admitted to her office’s ignorance at last week’s 2010 PopTech conference. By May, the St. Petersburg Times reported, there were still no federal standards for how much dispersant could be present in seafood consumed by humans, a detail the paper confirmed with the National Oceanic and Atmospheric Administration (NOAA). 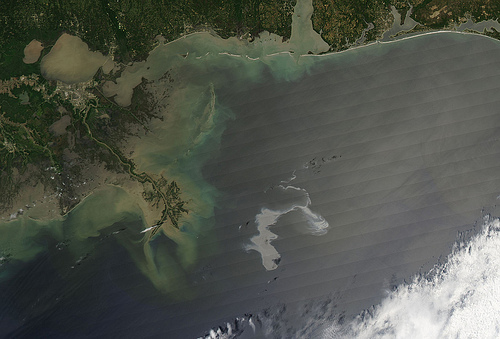 Building upon the extensive testing and protocols already in use by federal, state and local officials for the fishing waters of the Gulf, NOAA and FDA have developed and are using a chemical test to detect dispersants used in the Deepwater Horizon-BP oil spill in fish, oysters, crab and shrimp…. Experts trained in a rigorous sensory analysis process have been testing Gulf seafood for the presence of contaminants, and every seafood sample from reopened waters has passed sensory testing for contamination with oil and dispersant. Nonetheless, to ensure consumers have total confidence in the [emphasis added] safety of seafood being harvested from the Gulf, NOAA and FDA have added [a] second test for dispersant when considering reopening Gulf waters to fishing. Using this new, second test, in the Gulf scientists have tested 1,735 tissue samples including more than half of those collected to reopen Gulf of Mexico federal waters. Only a few showed trace amounts of dispersants residue (13 of the 1,735) and they were well below the safety threshold of 100 parts per million for finfish and 500 parts per million for shrimp, crabs and oysters. As such, they do not pose a threat to human health. One researcher studying the impact of dispersants in the Gulf, told Al Jazeera about dolphins— and people— hemorrhaging from too much dispersant exposure. Gulf residents showed off pieces of their boats that had been eaten away by dispersant-contaminated waters over just a short time. How could the new FDA-NOAA tests declare the seafood from the Gulf oil spill waters safe to eat in light of Al Jazeera’s (and so many others’) reports? [UPDATE: Readers requested clarification on “others’ reports.”] News organizations from MotherJones to the Washington Post and New York Times have run stories that examine the issue of dispersants’ toxicity in a similar light. According to the press statement, the government labs tested for traces of dioctyl sodium sulfosuccinate, a.k.a. DOSS, a component of the dispersants used in the Gulf that’s approved by the FDA for use in various household products and over-the-counter medication at low levels. They didn’t test for the other stuff that’s included in Corexit 9500 the primary dispersant used by BP and still sprayed over the Gulf these days. [Update: further detail on ingredients in disperants.] The labs also didn’t test the toxicity of oil-and-dispersant combined. Corexit 9500 includes ingredients like propanols that are used in household cleaners (which one presumably shouldn’t eat) but it is less toxic than some other Corexit dispersants, which include the ingredient 2-butoxyethanol. These other Corexit dispersants were likely used in the immediate response to the oil spill. BP and Nalco— the company that makes Corexit— for some reason, haven’t revealed the exact ingredients of what they used, how much of it, and when in the Gulf waters. Nalco sticks to the message that it has only been “making” Corexit 9500 for Gulf responders since the start of the spill.